Are you looking for a unique way to decorate your foyer? Read on! At DecorativeLettering, we have wall words that are suitable for your homes. 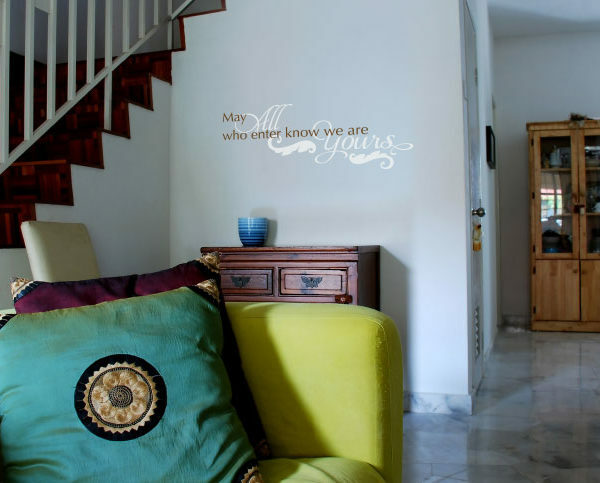 ‘May all who enter know we are Yours’ wall lettering will look amazing in your foyer-entry! We applied them on this pastel blue underlying wall and were pleased with the results. Below them is a table with a blue vase. The contrast is beautiful and makes them visible. They also tie in with the cushions. Friends and family will certainly appreciate the welcoming and reassuring message on the wall! DecorativeLettering products are easy to apply. It does not take long. Simply peel the back sheet and paste the adhesive side of the wall lettering. Made from resin they are low on maintenance. This also makes them resistant to extreme temperatures. You shall enjoy them all year round! To place your order, visit us on our user-friendly website. Have a look at our ‘By Room: Foyer-entry way’ category and select a quote. Submit your preferred one if we do not have what you are looking for! Make sure you use our previewer to confirm that you have made the right choice on style, size, and color. Submit: our talented designers will take it from there. Do you live overseas? Worry not! You too can enjoy our wall decals: we ship worldwide. Let us help you decorate with stylish wall decor that helps you say ‘welcome’ in a special way!